Vitamin E includes lipophilic derivatives of chromanol having one, two, or three methyl substituents on the phenolic ring. Vitamin E molecules, mainly α- and γ-tocopherols, are the most important antioxidants in nature. Their antioxidant effect is optimum at a certain range of concentrations, above which the vitamin exhibits a loss of efficacy or a prooxidant effect depending on the external conditions, including the nature of existing lipids and interfacial compounds, temperature, etc. Recent understandings of antioxidant mechanisms highlighted the importance of the microenvironment and how it influences synergistic and antagonistic interactions. Vitamin E components are not only antioxidants protecting polyunsaturated fatty acids from free radical attack, but they also seem to have stabilizing role in cell membranes, where molecular organization plays a very important role. In biological systems, α-tocopherol functions as part of an integrated antioxidant defense system in concert with vitamin C and other hydrophilic components. 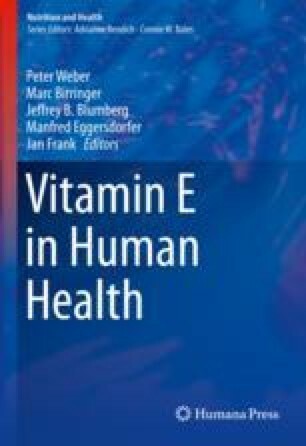 This chapter reviews the chemical basis of the antioxidant mechanism of vitamin E according to contemporary knowledge. Porter WL, Kapsalis JG, Wetherby AM, Drolet AM, Black ED. A rationale for evaluation and selection of antioxidants for protection of ration items of different types. 1982 Conference paper, available at https://apps.dtic.mil/dtic/tr/fulltext/u2/a117476.pdf. Accessed 18 May 2018. Leermakers M. Statistical thermodynamics of association colloids: the equilibrium structure of micelles, vesicles, and bilayer membranes. PhD Thesis, University of Wageningen, The Netherlands. http://edepot.wur.nl/201851; 1988.